Arco-Íris (Leiria, Portugal) on 18 September 2009 in People & Portrait and Portfolio. La verdad que le hace falta algo de sombra por que creo que se ha quemado al sol, buena composicion. 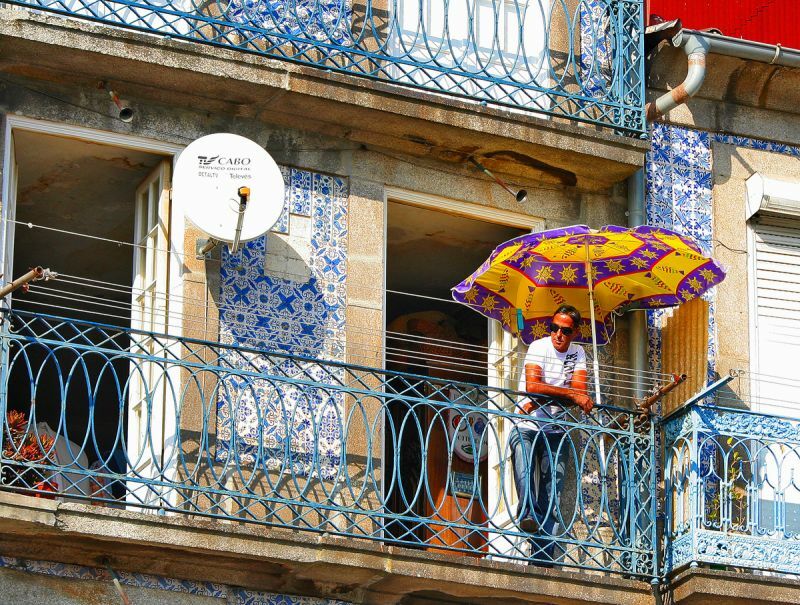 I love this street photos, beautiful colors, beautiful balconies! Cool pour regarder le spectacle, il est aux premières loges! :) Belles couleurs! he certainly has the best place to look at the race. No need of a parabola to watch it, the parasol is much better. Super colours; these glazed tiles are amazing! Une belle palette de couleurs !! Great colours and details.What a well spotted scene !! Those tiles on the wall a great work of art! Colorful photo with that man under his fancy umbrella! ...mas dá-me ideia que esse homem estava num ponto melhor que tu, hehe (e ainda por cima à larga sem mais ninguém a empurrar e apertar como devia ser no resto dos locais). Interesting life on that balcony; good capture. Such wonderful colours, textures and lovely ironwork in these buildings and you capture it well. Graphisme, couleurs et composition originale, magnifique.... bravo, Philippe. What vivid colors. This is a very good image. Full sun images are so hard to take. I think you did an amazing job in such harsh sunlight conditions. Um espectador preveligiado. Bonita foto e bonitos tons/cores. parabola contras parábola prato colorido! bela foto, ana lucia! Great colors. Very interesting shot. Talvez ,um pouco de contraste de cor a menos não ficaria mau, minha opinião, claro. .. superb shot... great composition, and excellent color. Nice choice for illustrating an Air Race! It was in August, and the crowd is always incredible. Bonita foto, los colores crean un ambiente luminoso y alegre que me gusta. Looks like he has a prime location to watch the race. Great shot. I like the abundance of detail in this image. I can feel the heat of the summer. The yellow color jumps out of the umbrella. Very nice. les couleurs et le graphisme des balcons se mêlent pour une photo nonchalante qui brille de lumière..
A great series you have here. These air races are fast and furious. I'm sure this balcony would offer the perfect vantage point to view this event. I just love this. Well done. An excellent study. Love the colours and detail.